Where's Jack Ruby when you need him? Controversy swirled more incessantly than a Margarita machine during spring break at the past Toronto International Film Festival. 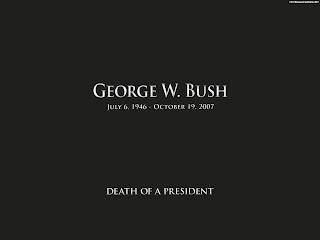 Making its North American premiere was Gabriel Range's DEATH OF A PRESIDENT, the British television "documentary" positing what would happen if President George W. Bush were to be assassinated. Alas, even though the film is now available worldwide on DVD, the answer remains a mystery, shrouded by inept filmmaking and gutless convictions. There is, of course, the issue of bad taste, and some would argue this is taboo subject matter while we are fighting a War on Anxiety. Just like the unwritten rule in cinema that decrees you don't kill the dog if you want your audience to stay with you, one can argue that it is totally irresponsible to kill a president while he's still in office -- even if his approval rating is less attractive than a diseased rutabaga. Surprisingly, Bush is not seen as a villain. In fact, he is depicted more as a tragic victim of circumstance. Unfortunately, it takes approximately forty minutes of mundane foreplay for us to get to the primary plot point and by then most viewers will not care one way or another out of sheer boredom. And this is the good half; from this point on DEATH OF A PRESIDENT is like sleeping on the wet spot. Instead of the anticipated incisive exploration of American politics and worldwide consequences such an act would produce, we are merely presented with three possible suspects turning DEATH OF A PRESIDENT into an uninspired, clumsy and forgettable "who done it." Talk about chickening out; one would almost believe that this DEATH was at the hands of Sir John Tyson. And since Mr. Range provides so little background information on these characters and virtually no insight into their personalities, we learn less than the Warren Commission. In the end, the reigning Cheney Administration is seen as doing everything in its power to make the Syrian suspect appear guilty so as to further advance their efforts at saber-rattling and, surprise, surprise, the Patriot Act is amended to strip away even more constitutional liberties. This unsatisfactory denouement is not only lame, it is impotent by every sense of the word. Given all the ballyhoo preceding the release of DEATH OF A PRESIDENT one can readily see that the buffoon here is not King George but Writer/Director Range. This Gabriel's horn bloweth shrill and oh-so-hollow; may he never set his sights behind a motion picture camera again. Yes, where is Jack Ruby?